..from the rooftop deck of a gorgeous boat with pizza in your belly and a drink in your hand! 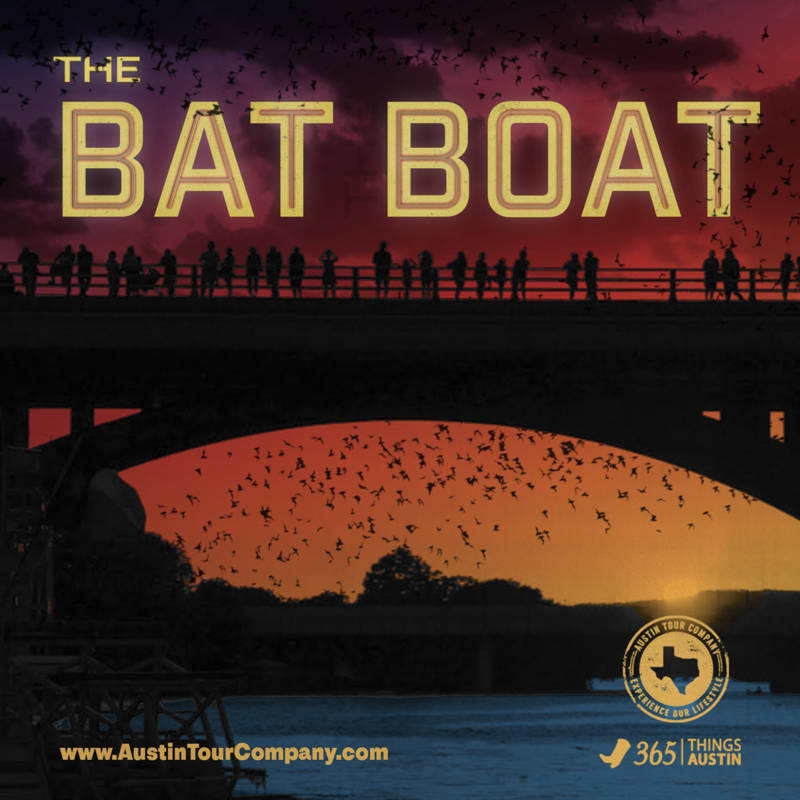 We've partnered with 365 Things Austin & Capital Cruises again to bring you, The Bat Boat! 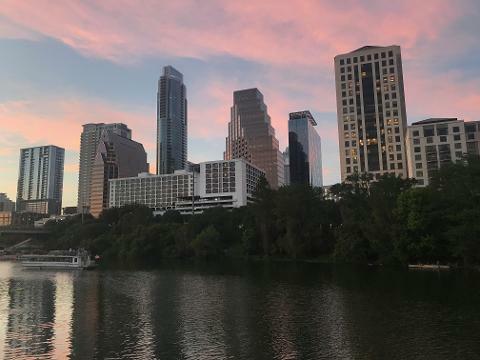 Enjoy great music, food, and drinks aboard a double-decker boat with a rooftop deck, an air-conditioned lower deck, and bathrooms. 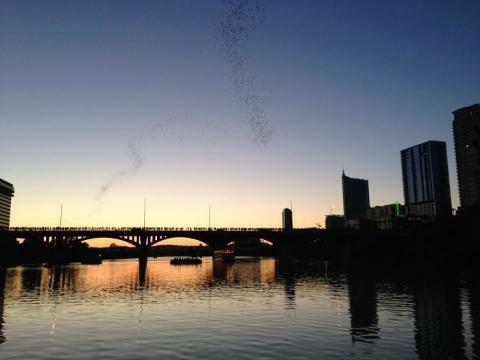 We’ll stop near the Congress Bridge at sunset to watch the bats fly, while giving you a bit more information about them. 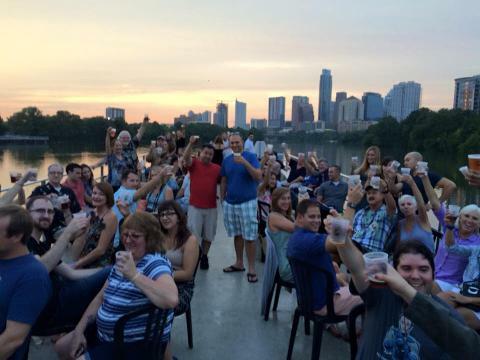 Each Bat Boat features a different local beer, wine, or cider vendor, so you can feel great about participating in this local tradition, while supporting local businesses. Our vendors rotate each week - Please see below and check out our Facebook Events to learn more! BYOB of additional beverages and food is permitted. Check In is at The YETI BARRR and officially begins 30 minutes prior to your departure time - we recommend arriving early to enjoy the bar and check out the store -stay tuned for this season's pre-cruise specials! We'll head to the dock as a group 5 minutes prior to departure time. We set sail promptly at the given departure time - please don’t be late! You do not need a printed confirmation, we will check you in electronically once you arrive. Don’t miss your chance to see the bats fly from the best seat in the house - BOOK NOW! Follow us on social media for updates on food and beverage partners! As locals know, our weather can be very unpredictable! If we must cancel a Bat Boat due to weather, we will notify all guests by 4:00 PM on the day of the boat and we will refund or transfer all reservations. Refund and Reschedule Requests will be honored if made 72 hours or more before the departure date/time of the boat.